Almost everyone will end up living with a roommate at one point or another, and it always takes some getting used to. Having conflicts with someone you live with can be uncomfortable and awkward, which is why ground rules are so important. Laying down the rules at the beginning will establish what is acceptable and expected so there is not as much conflict or confusion later on. Rules may not guarantee complete harmony with your roommate, but it will be much easier to talk about your frustrations if the rules have existed from the beginning of your relationship. 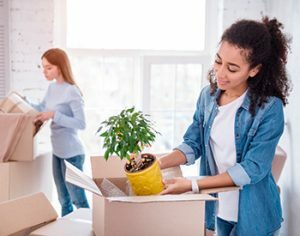 Whether it’s paying for household necessities, agreeing on cleaning expectations, having enough time to get ready in the morning or finding common ground with each other’s music preferences, you will probably need to come to a few compromises with your roommate that will make you both happier at home. Find out which rules are the most important ones to establish with your roommates below. First and foremost, it is important to talk about how you will keep your apartment or house secure. When you are living with someone else, you want to feel that you can trust that person to lock the door and follow other rules that keep you both safe. Your rules will probably depend on how safe your community or apartment building is, but no matter what, it’s important that you are both on the same page so you can feel safe at home. No matter how clear you are about rules in the beginning, you will probably both need to remind one another of certain agreements from time to time. Whether you want to communicate by texting, talking in person or leaving a note, it helps to decide how issues should be communicated so no one feels uncomfortable when a problem comes up. Everyone hopes to find a roommate with similar ideas of cleanliness before moving in together, but sometimes reality fails to live up to expectations. One of the biggest sources of conflict is having to put up with a messy roommate. However, establishing who is responsible for which chores ahead of time will make it easier to talk about untidiness if it becomes a problem. Roommates should never assume that the other person will take care of certain chores, such as vacuuming or doing the dishes. These tasks might not ever get done if each of you thinks the other will take care of it. When you’re living with someone, you will probably end up borrowing and sharing many of your household items. However, you cannot assume that your roommate is okay with this unless you talk about it first. When it comes to food, furniture, cleaning supplies and even items like toilet paper, you will want to discuss what is communal and what is personal property. When living with a roommate, you will have a variety of shared expenses, such as rent, utilities and any food or household supplies you decide to share. It is crucial to talk about who will cover each of these costs rather than making any assumptions. For certain expenses, such as household necessities, you can try putting cash in a jar that you can only use to pay for things like milk or toilet paper for the apartment. To keep each other accountable, you can also throw the receipt in the jar as well as the spare change after any purchase for a household item. While you will usually have free reign of a bedroom, other areas like the living room, bathroom and kitchen will obviously end up being used by everyone in the house. To make sure you do not step on any toes in these shared spaces, you will want to talk about how you will use them and how clean they should be kept. It is usually a good idea to agree that any messes in shared spaces should be cleaned up before leaving a room. Whether this means doing the dishes after a meal or tidying up a project in the living room once you are done, you and any roommates will be happier if you are on the same page. No matter how social you are, it is crucial to talk about when it’s okay to have people over. If your roommate expects to constantly have friends or a significant other visiting and you would rather have the place to yourself more often, this will create a conflict down the road. Instead of assuming that it is okay to have people over at any time, discuss how often you plan on having people visit ahead of time. Establish when it’s okay to have overnight guests and what time guests are expected to leave when they are not spending the night. If you’re a night owl but your roommate rises with the sun, a few conflicts can easily come up. Start by talking about your schedules and then determine which activities or noise levels are acceptable when the other is trying to get some sleep. If, on the other hand, you have similar schedules, you will need to agree who can get ready first so you both have the time you need. If you are lucky enough to find a roommate with similar taste in music, movies or TV shows, it can be great, If not, it is important to discuss this ahead of time so you do not have to suffer through a marathon of shows you hate watching or a session of music you cannot stand. Listening to music with headphones is a great solution if you have different tastes. As far as TV goes, you may need to agree who can watch what at certain times so neither of you misses out on your favorite series or makes the other person miserable.